"The folders turned out perfect. 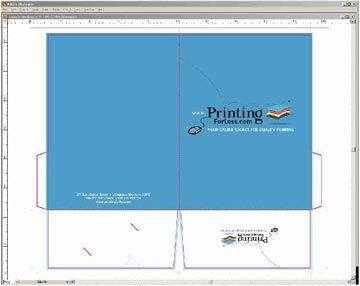 It was no easy task with all the specialty features, including, the multiple embossing, specialty die-cuts/folds, clear foils and the metallic pantone - & you guys rocked all of it." 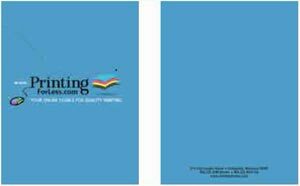 To produce a presentation or pocket folder you have two options to generate the artwork. Front Cover: 9.25" x 12.25"
Back Cover: 9.25" x 12.25"
Inside Picture: 18.25" x 9.25"
Follow these instructions if you want to layout the complete artwork as shown in Figure 1 above and have one of the software programs listed below. You will first need to download a template from our Presentation Folder Templates Page. Follow the initial instructions below for the program, then follow the General Instructions to add your artwork. Under File menu select new. Under Insert menu choose Picture .. From File select the template you downloaded. In your layers palette, lock the layer that has the template on it. 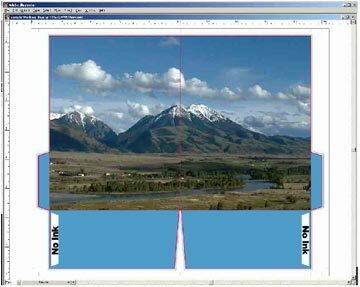 You will need to lay out your artwork on other layers as the template needs to be removed when the file is printed. After following the previous instructions you should have a screen that looks Figure 3 at right. As you work, try not to move or change the elements in the template. If the program you are working in has layers, it is best to keep the template layer locked. If the program you are working can lock objects, lock all the elements of the template. 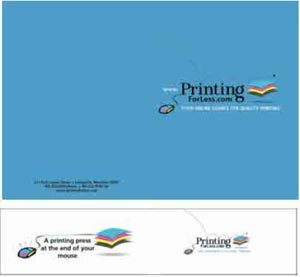 The template used for these instructions is the template for a 2 pocket presentation folder with business card slits on the inside right pocket. 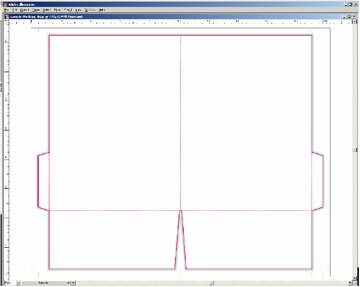 The red lines indicate where the folder will be cut out (solid) or folded (dotted). The blue lines indicate where bleeds should be. 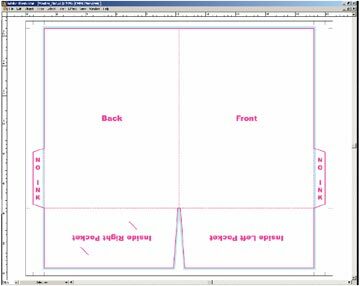 When you are done laying out your artwork, move the template to the top layer. The template contains knockouts for the areas that cannot have ink. These areas are necessary for the glue to stick. Begin laying out your artwork. There is no bleed on the pocket or the spine. If your design only has an image on the front, it only needs to bleed 2 sides. Leave 1/8" "Safe" zone from trim and folds (Green area). 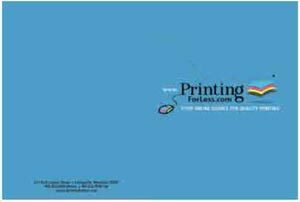 For more information about "Safe Zones," Click Here While this is for business cards, the principle is the same for any product we print. 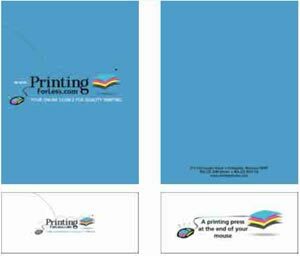 Note that if you order 4-color on the front and Blank on the back, you can still get printing on the inside pockets which fold up when assembled. 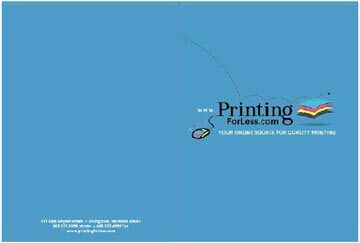 This file can also be used for layout if you like. 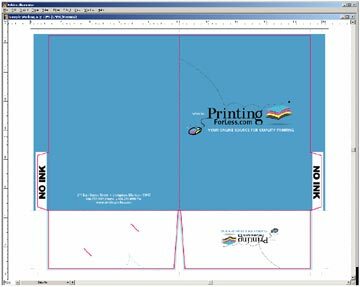 If you are printing on the inside (either 4-color on both sides or 4-color on one side and black on the inside) please download the appropriate template. Notice this time, the bleeds on the glue flaps are to the outer edges. This is because the glue is on the other side. Layout your artwork as before. The bleeds on the glue flaps are not for the main background picture. Bleed the picture off the edges that will be trimmed, but not past the dotted fold line on the glue flaps as shown here. This is what it would look like if you wanted to print blue on the inside of the pockets. The glue tabs have the blue color so that when they are folded in and the pockets are folded up, everything matches. Notice the white knockouts. Once again, this is where the glue needs to stick. This is what you end up with inside. Remember, the blue on the pockets ended up on the inside of the pockets, not the outside. Or you can combine panels as you wish. 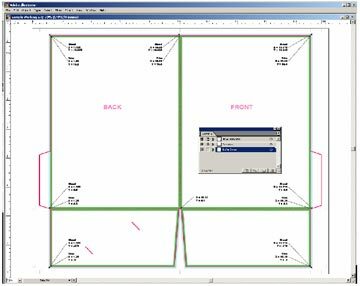 If you are going to work with combined panels, use following dimensions. Large Panels are 9" x 12" so you will need to create artwork that is 18" x 12". If you have content that will go right to the edge, you need to "bleed" off the edge by 1/8". 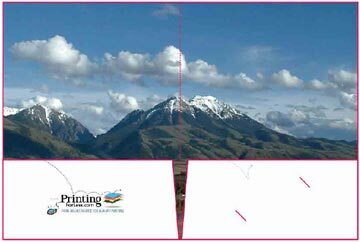 If your content is to the edge on all sides, your image for the large panels needs to be 18-1/4" x 12-1/4". 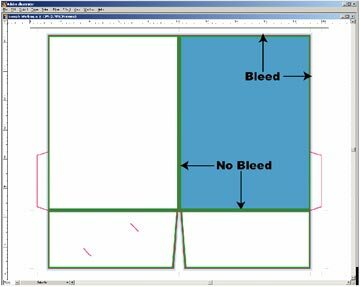 Even though the image does not bleed onto the pockets, it is better that you provide bleed on all sides so things get centered properly. 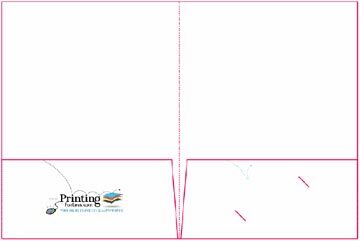 The pockets are 9" x 4" so you need to create artwork that is 18" x 4"
Again please provide bleed if the content goes right to the edge. Keep in mind that the pockets are 9 inches at the bottom, but only 8-7/8 at the top, so do not get too close to the edge with content. 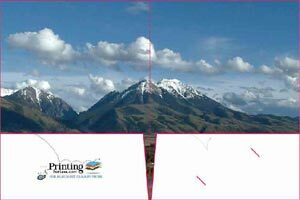 If you are printing on both sides all the dimensions remain the same but remember, when the pockets fold up, the will cover the bottom 4" of the artwork. Congratulations, your Presentation Folder is now ready! Place your order now and they can be ready to ship in 7 business days! Or, if you have already placed your order, you can now upload your files. Be sure to have your order number handy. Be sure to upload the native files. It is better not to produce PDF files and upload them. 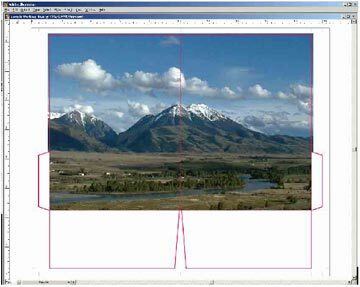 It is especially important with PhotoShop to send the Layered PhotoShop file. Need help with your next folder project? 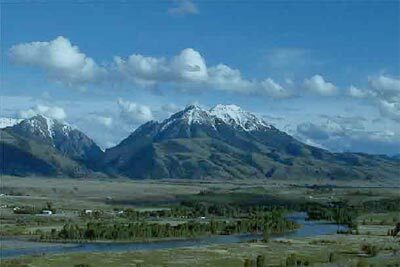 Give our helpful experts a call at 800-­930-2423.